Sunday’s star-studded Galaxy-NYCFC match had all the glitz you’d expect. In the end, LA—boasting more than just big names—came away with a dominating win thanks to depth the expansion club can’t yet match. CARSON, Calif. — On Saturday night, it was already decided New York City Football Club’s match against the Los Angeles Galaxy would not feature the latest installment of Frank Lampard and Steven Gerrard’s famous rivalry. The allure of the “British Invasion” aside, David Villa, Andrea Pirlo, Giovani Dos Santos, Robbie Keane and Gerrard playing on the same pitch surrounded the game with an amount of hype unprecedented for a regular-season MLS game. When the final whistle blew on Sunday afternoon, it was clear that NYCFC had made the right decision in keeping Lampard out of the match due to his lingering quad issue. Even at his youthful best, the Chelsea legend wouldn’t have bridged the gulf that separated the two teams on the field on Sunday. Los Angeles absorbed early pressure from the glitzy expansion team from the east coast in the game’s opening stages. Then, over the last 70 minutes of the match, the Galaxy showed NYCFC the difference between talented names on a roster and a talented team with a complete and dominating performance in a 5–1 win. Indeed, in the first 14 minutes of the match, NYCFC had five on-target attempts. L.A. had one. But in the final 30 minutes of the first half, L.A. racked up 14 shots while NYCFC was held mostly quiet. The only exception was a near miss over the crossbar by midfielder Tommy McNamara in the 38th minute after Gyasi Zardes had put L.A. in front with a header assisted by Robbie Keane in the 36th. At halftime, NYCFC had completed over 100 more passes than L.A (266/163) at a higher success rate (86.8%/ 84%) but was behind. In the second half, Los Angeles’s talent-laden outfit displayed chemistry that NYCFC, five months into its inaugural season, continues to search for. Perfect passes through NYCFC’s back line created eight shots, five on target, and produced four goals for L.A. The understanding that Dos Santos and Keane are rapidly developing continued to net results; Dos Santos assisted Keane’s goal in the 54th minute and Keane returned the favor 13 minutes later. Gerrard sprayed the ball accurately all afternoon. He recorded an assist on Sebastian Lletget’s goal in the 70th minute and also paired very well with Juninho in the midfield, keeping the ball moving into the attacking third and helping on defense. New York City’s designated players were not without their moments. Pirlo displayed his skill early and often in the first half; the Italian maestro had two passes to Villa and Kwadwo Poku, in the fourth and fifth minutes, respectively, that put each player in excellent position to score. Villa’s shot was blocked. Poku didn’t get an attempt off. By the time Pirlo left the pitch in the 75th minute, L.A.’s fans were comfortable giving him a resounding ovation because, for all his world-class skill, the score was 4–0 in their favor. Villa had four shots on target blocked and missed another three attempts. By the time he opened NYCFC’s scoring from the penalty spot in the 80th minute, he’d spent much of the game with his hands in the air or on his face. For all of the attention paid to the designated and national team players in this match, it was the supporting cast that proved the difference. L.A’s big names played off the rest of the team like they’d been doing so for some time. NYCFC’s supporting cast wilted in the bright spotlight. New York’s back line, which is taking much longer that L.A.’s attack to gel, continued to allow space for passes and runs. There were individual moments in the midfield, but it continued to lack cohesion as a unit. None of that came as a surprise to Arena. MLS had every reason to advertise this game to be the star-studded affair that it turned out to be. A crowd of approximately 27,000 came to the Stubhub Center not only to see a soccer match, they came to witness the tangible progression of the league. But it takes more than marquee names to win in between the lines. A combination of chemistry and talent at all positions is key, because the best teams in the league have so much of both. 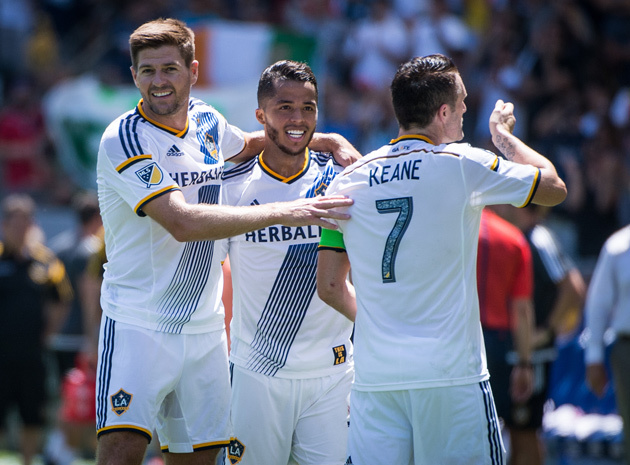 The Galaxy reinforced that lesson to NYCFC on Sunday.